All the information ascribed to newspapers has come from British Newspaper Archive. 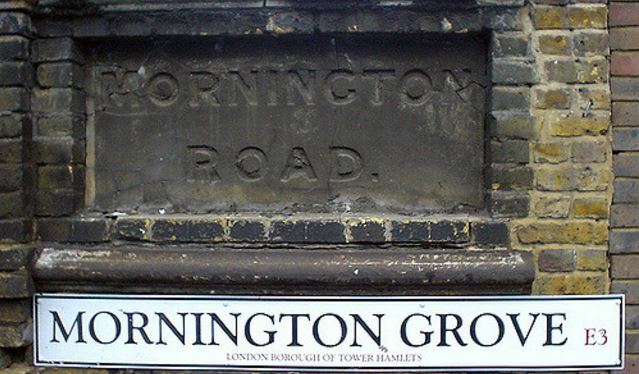 On 1 January 1939 the Road had its name changed to Grove, Mornington Grove. This list is of residents who lived in Mornington Road from 1900 till that day. 1901 Morton, Hugh & family. In 1901, the draper’s business (specialising in Linen) and Morton family home was at 13, Mornington Road, Bromley Bow. Only 3 children, Alexander aged 21; Grace aged 13 and Hugh aged 12 were still living at home. There was also another draper’s shop belonging to the family at 187, Bow Road. In 1903, Hugh aged 13 became a scholar at Coopers’ Company and Coborn School (founded in 1536) in Tredegar Square, Mile End London. Hugh joined the school’s Army Cadet Corps and was a member until he left the school in 1908. Hugh Morton senior died on the 19th July 1906 aged 62 when young Hugh was just 16 years old. Probate was granted to his widow Jessie Morton, his eldest son John Morton, also a draper and James Robert Morton M.B., his second eldest son. Hugh Morton senior left effects to his family which amounted to the sum of £5723 -7s-6d. – From an interesting illustrated article about Hugh Morton, with much content about drapers in East London. 1926 Lever, Harvey Walter was had up for dangerous driving, reported as follows in the Whitstable Times and Herne Bay Herald, 28 August 1926: RAID ON MOTORISTS: Harvey Walter Lever, of 18 Mornington Road, Bow, E., was summoned for driving a motor car in a manner dangerous to the public at Preston on the 8th inst. Sergeant Jenner stated that at 12.30 p.m. on the date in question he was on the London Road near Preston village when he saw defendant driving a motor car in the direction of Canterbury. There was a stream of motor cars coming in the same direction and there were also a lot of pedestrians about. Defendant drew his car out over the white line and accelerated to quite 30 miles an hour. He passed five or six other vehicles before he got back into the line of traffic. Witness stopped him and drew his attention to the notice boards each side of the village warning motorists as to the danger of exceeding eight miles an hour, and also the object of the while line. He replied that his brakes either would not act or slipped. Witness told him he should report him. If anything had come out of Mill Lane or Salters Road defendant could not have avoided a collision. Defendant wrote a long letter to the Bench, but it was not read in public. The Bench imposed a fine of £4 including 2s. 6d. for a private witness. The Mayor remarked that they were pleased the Sergeant had brought the case forward.